Asparagus pasta is a great spring dinner that can be ready in 10 minutes. It’s asparagus pasta time which means spring is finally here! I hate to complain as it was a pretty mild winter in Toronto thanks to El Niño but I love springtime and how each week there’s a new fruit or vegetable in season. But it all begins with asparagus, that’s when we know warm weather, farmers markets and local produce is on its way. 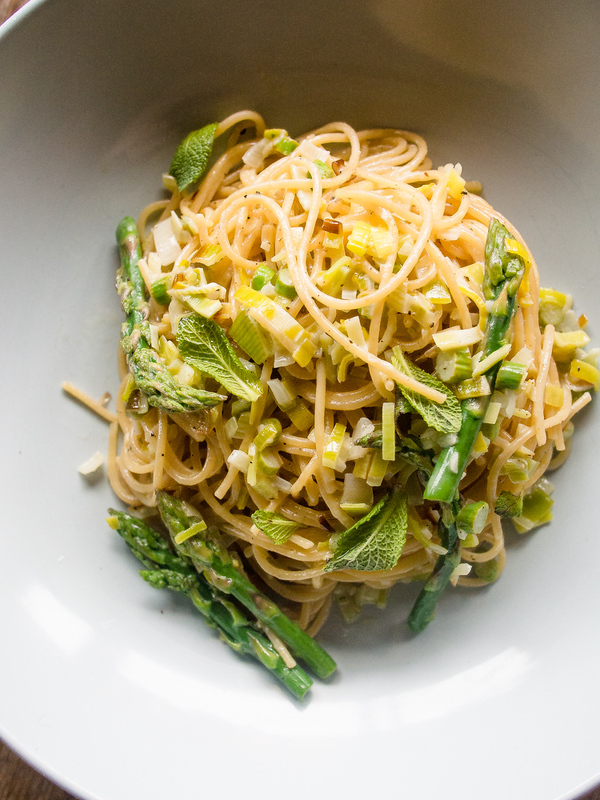 While we do eat spaghetti aglio olio at least once a week, we get excited about spring. Not all pasta recipes need to be heavy, pasta is a great way to incorporate more vegetables into dinner. And this asparagus pasta is light and so much healthier than eating out. You could find this asparagus pasta recipe in a French bistro in the spring, or you can make it at home. The best part is that it takes less than ten minutes to make. It’s perfect when you are tired getting home from work but it’s also tasty enough to serve to friends on the weekend. Today we went into our restaurant Loka early for paperwork. 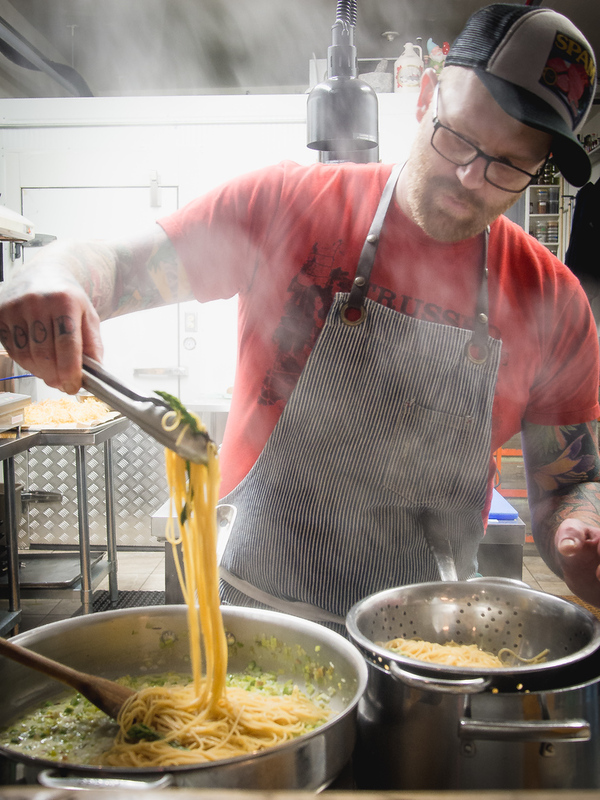 Not the most fun couple activity but Dave sweetened the deal by making asparagus spears, mint and lemon leek cream spaghettini. At first I thought it would be a big production but chefs are efficient and he showed me all we needed was one pot to boil pasta and one pan to make the sauce. In less than 10 minutes, seriously. If you want quick and easy meals that everyone loves then cream is your friend. Not only can it make a great quick sauce but it also has a long shelf life in the fridge. In our culture of fearing fat we’ve lost our love of cream and instead think we can make a great sauce by substituting skim milk. You can’t. Cream exists for a reason! It’s delicious and you don’t need to add a lot of it to make a velvety sauce. It’s all about moderation. And there’s no reason to cut out cream especially if you balance it with vegetables and fibe. You really can have it all. 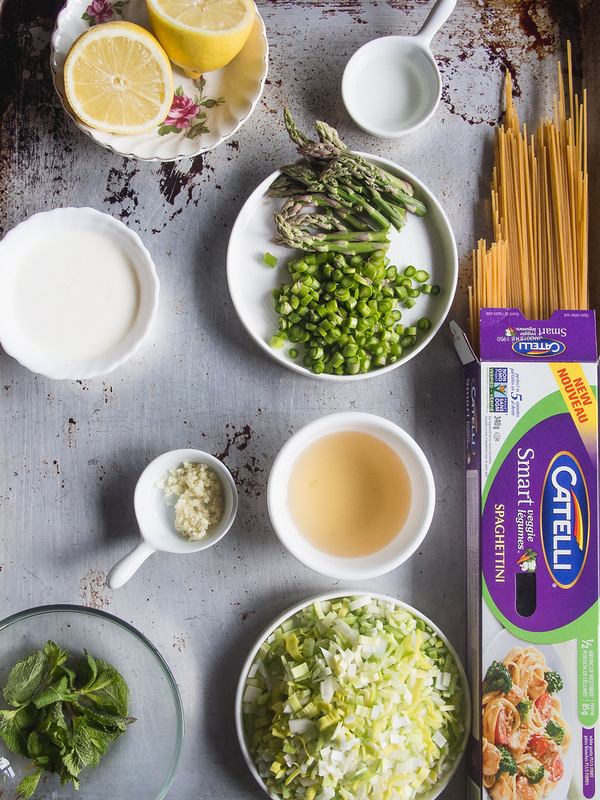 For this recipe we’re using Catelli Smart Veggie Spaghettini, a white pasta with a high source of fibre that provides a ½ serving of vegetables per 85 grams. It’s made with 100% Canadian wheat and oat fibre with carrots and cauliflower and Non-GMO Project Verified. One of the perks of being part of the #CatelliFamilies network is that we can experiment with all the new pasta innovations as well as staple lineups that include healthier pasta options from 100% whole grain Canadian wheat and Catelli Gluten Free to Catelli Smart with a very high source of fibre. Frankly you would never know this is a healthier version as you don’t compromise taste, no one will ever know! Bring 4 litres water to a boil, add 1/2 cup (125 mL) of kosher salt. Over medium high heat, add canola oil to large sauté pan. Add leeks and cook for 4 minutes. Add asparagus, cook for 2 minutes. Add garlic and sauté for 30 seconds. Deglaze by adding white wine. Add chicken stock and cream. Bring to a boil and reduce to low heat. Squeeze in juice of one lemon. Add asparagus tips to boiling pasta water in last minute of cooking. Drain cooked pasta and asparagus tips. Toss in cream sauce and add mint leaves. If you’d like to try Catelli’s new products, take a look at Checkout 51 an online site that helps Canadians save more on the brands they love. In April, Checkout 51 will offer a discount on Catelli Smart Veggie and Catelli SuperGreens. It’s an all-natural pasta made with a blend of five green vegetables including spinach, zucchini, broccoli, parsley and kale. I downloaded the app and like that it saves money on brands I already buy. We’re looking for more easy spring pasta recipes, if you have one share in the comments below. Active in social media? Share your favourite pasta recipe and hashtag #CatelliFamilies so we can find you there too. Disclosure: This asparagus pasta post is part of a four part series in partnership with Catelli Pasta, a great Canadian brand that has asked us to share our favourite pasta recipes. Even if they hadn’t approached us we would still be eating pasta 3-4 nights a week. 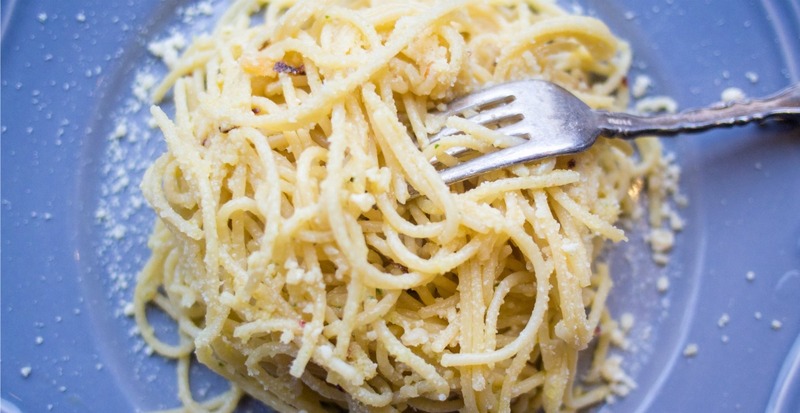 This is an incredible low-fat pasta dish. I serve it to organization constantly. Present with a natural product plate of mixed greens and French bread. It’s really delicious pasta recipe . This looks wonderful and yay for spring finally arriving! Fantastic flavours here, and it’s so… springy! I adore asparagus with pasta (I’ve got a recipe on my site too in fact, though the other flavours are quite different). I’m quite taken by the use of leeks and mint here (MINT!). It’s such a wonderful, interesting, and evocative combination. Seriously, I’m loving this whole thing. Oh, and I have to agree with you about cream. Funny enough, so many sub-par ‘Italian’ restaurants seem to think that they can drown sloppy work in cream, and we gobble it up with gusto while remaining unwilling to use the good stuff at home. I’ve never understood this. Used judiciously and with good ingredients, cream is amazing! This looks so fresh and flavourful… just the kind of thing I’ve been craving now that spring is here. I haven’t seen the Catelli vegetable pasta in stores yet, but I’ll have to keep an eye out. Anything to add a little more veggies to the diet is a good thing! Yes! Another wonderful asparagus recipe to add to the repertoire. I can’t get enough asparagus when it’s in season! The mint is quite intriguing and I can’t wait to try this out. wow ! looks yummy This is an incredible low-fat pasta dish. I’ve been to Japan and currently in Taiwan. I always love eating ramen and noodle soup. But I love pasta and always on the look for a recipe to have my pasta a variety of flavor. Yes, this looks deliciously awesome and I can’t wait to follow the steps of your recipe. I love the green and yellow mixture of pasta which I always have red or tomatoes. I agree on so many levels! 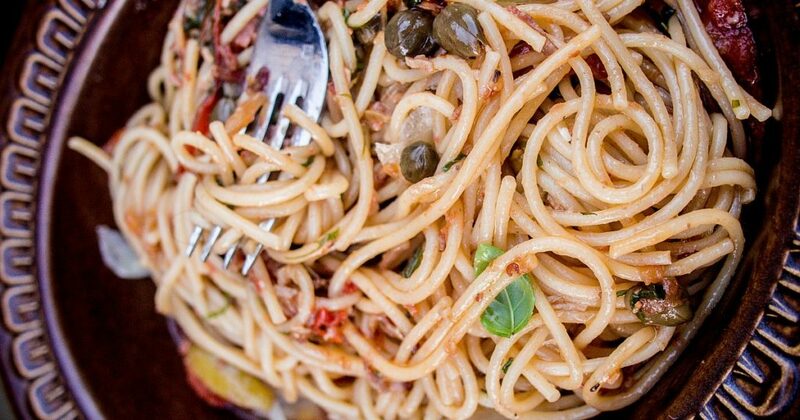 Pasta is our go-to meal 2-3 times a week, especially the busy weeknights. It takes almost no time and it always tastes amazing! This pasta is perfect for spring, with its lovely delicate flavors. “Cream exists for a reason!” My new life motto, thank you. Pasta is my lovely food and when I reach your post realized there are many recipes to make pasta and Make an amazing pasta. Thanks for sharing. This look really incredible dish in your post! I really like pasta. You shared awesome flavors and dish! Mouth watering pasta. Can’t wait to taste it. Thank you so much. Well he wasn’t at home to cook but at work. However to recipe test he made all the recipes first and then I had to use the instructions on my own to fill in instructional cracks and timed myself as well. But I agree some cooks are faster than others. My husband is obsessed with pasta and I’ll 100% try it this weekend. wow, this is so easy and quick mouth watering recipe and i love pasta. Definitely gonna try it today. By the way love your recipe and picture of it.